Trade shows are fantastic opportunities for businesses to gain exposure and show their products to a wide array of potential customers. However, in a sea of booths, your display might get overlooked if it’s too drab. To make the most of a trade show, your company’s booth needs to stand out and seem interesting to the crowd. 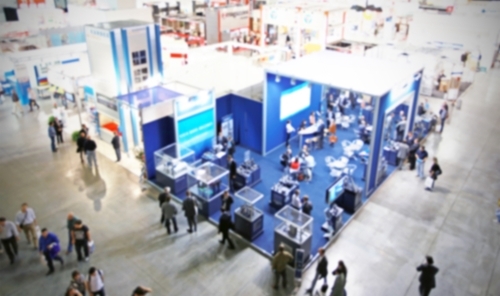 Here are some tips on designing a trade show booth that attendees will be sure to stop at. The backdrop of a trade show booth is the first thing people will focus on. Envision Creative, a design firm with experience in trade shows, recommended that a booth should have a full size, colorful graphic that spans the whole display. Skip the poster boards – they will appear unprofessional. Instead, hire a graphic designer to create a clean and aesthetically-appealing background for your booth. Any information a passerby might need should be included on this main graphic. The business name and logo should be displayed prominently, as should the website or phone number. It’s also wise to have the company’s message or purpose on the display. However, it should be simplified to a sentence at most. Busy people aren’t going to take the time to read a page-long mission statement, especially when there are hundreds of other booths to visit. Depending on the size of the booth, you may not have room to display a whole line of products. It’s important that a trade show booth isn’t stuffed with products and overwhelming to customers. Having too many items on display can also dilute the message you’re trying to convey. Alexis Exhibits, which specializes in trade show displays, suggested that companies bring only their newest or best-selling products. These are likely to be the most impressive to visitors, and your representatives can always talk in depth about other products the company offers. Booths that make use of the latest, most popular technology will be more engaging to customers. Interactive displays and informative videos will draw people to your booth and keep them interested. The best videos will serve as a prompt for conversation that will give representatives a chance to further inform visitors. Company representatives should also make the most of social media. Encourage visitors to tweet about their experience with a specific hashtag, or post pictures of your booth to Instagram. According to Envision Creative, having a promotional product to give away at a trade show increases traffic by 52 percent. The best products to entice visitors are ones that are useful, but also represent your company. Inc. recommended that you steer clear of over-used items like stress balls – they’re not unique and will likely end up in the trash. Instead, choose a product that is easily customizable and can be used even after the show ends. Pens, folders and thumb drives are classic choices, but an item that complements your services will leave a lasting impact on visitors. An appropriate giveaway for an airline might be Travel Ear Plugs in Personalized Case. It’s compact, reusable and extremely useful for frequent flyers. An auto supply store could offer a Custom Ice Scraper Glove for customers in chilly climates. The possibilities for promotional giveaways are endless, but a unique product will attract more visitors and leave a lasting impression. Companies should choose an item that adequately represents the brand and will be appreciated by potential customers.